This product is not available in the quantity requested. Since Marketing 3.0 inspired the world to embrace and explore human-centric marketing, pioneers in the field have applied advanced technologies to open new insights into who our customers are and how they make decisions. The valuable paradox of big data analytics is that it can create more personalized products and personal services, and Marketing 4.0 maps out an authoritative approach to taking customers from awareness to advocacy. 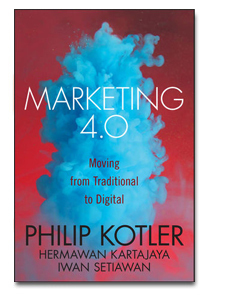 For this highly anticipated guide, the father of modern marketing, Philip Kotler rejoins thought leaders Hermawan Kartajaya and Iwan Setiawan from MarkPlus, Inc. to share tangible ways marketers can influence people of various paths along the customer journey. In fact, the traditional path to purchase (aware, appeal, ask, and act) expanded to include advocate because the opinions of our family and friends have an enormous impact on our buying decision – and fully updated coverage walks you through how it happens, the ways to encourage it, and strategies for growing one customized experience at a time using powerful metrics and innovative best practices.